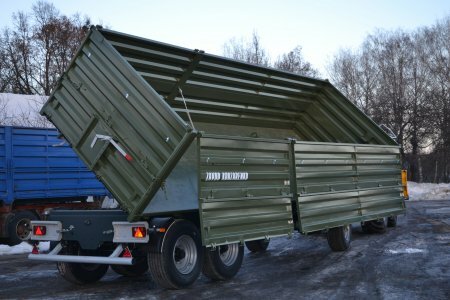 The trailer has a three-side unloading capacity and meets EU standards. It is equipped with a 4-stage telescope hydraulic cylinder (Italy). Available with a pneumatic or hydraulic braking system. 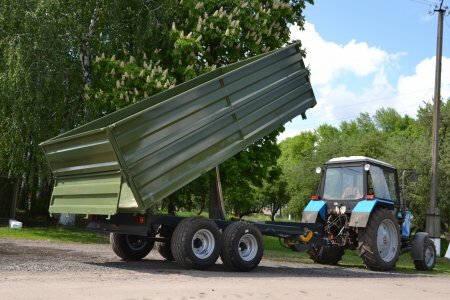 The trailer is made of high-quality steel, it is sandblasted, primed and powder-coated to ensure longevity and resistance to corrosion. Axles Italy (ADR), tyres Poland (Pronar), braking system – WABCO. 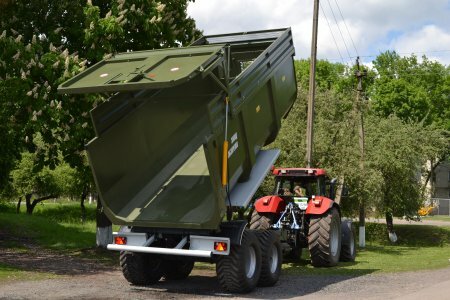 An end-dump trailer that meets EU standards. Equipped with a 4-stage telescope hydraulic cylinder (Italy). Available with a pneumatic or hydraulic braking system. 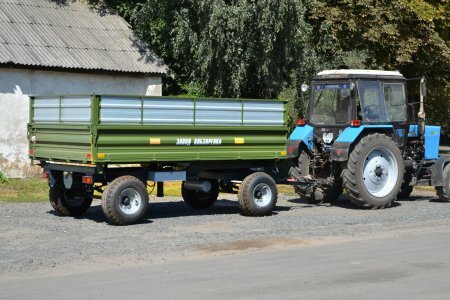 The trailer is made of high-quality steel, it is sandblasted, primed and powder-coated to ensure longevity and resistance to corrosion. Axles Italy (ADR), tyres Poland (Pronar), braking system – WABCO. 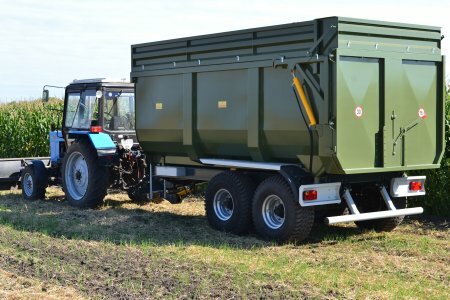 The trailer has a two-side discharge option and meets EU standards. Equipped with a 4-stage telescope hydraulic cylinder (Italy). Available with a pneumatic or hydraulic braking system. 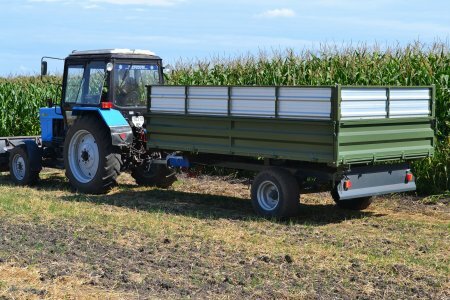 The trailer is made of high-quality steel, it is sandblasted, primed and powder-coated to ensure longevity and resistance to corrosion. Axles Italy (ADR), tyres Poland (Pronar), braking system – WABCO. 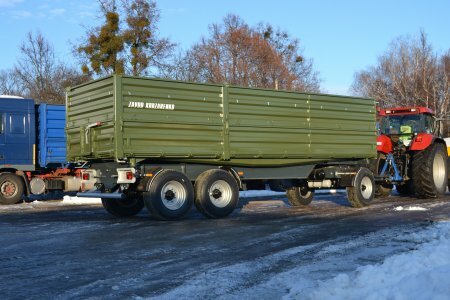 The trailer has a one-side tailgate discharge option, and it meets EU standards. The tailgate has an extra door to facilitate unloading. Tandem axles. Equipped with a 4-stage telescope hydraulic cylinder (Italy). Available with a pneumatic or hydraulic braking system. 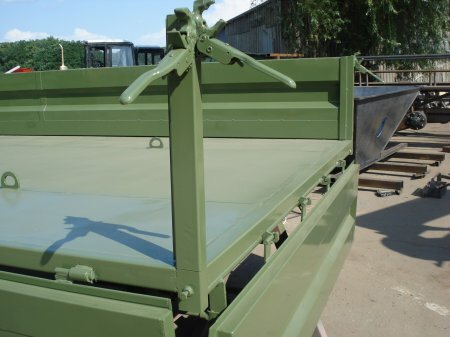 The trailer is made of high-quality steel, it is sandblasted, primed and powder-coated to ensure longevity and resistance to corrosion. Axles Italy (ADR), tyres Poland (Pronar), braking system – WABCO. 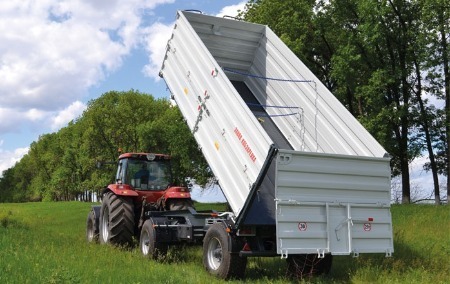 The trailer has a three-side unloading capacity and meets EU standards. Tandem axles. Front axle fixed to a movable frame. Equipped with a 4-stage telescope hydraulic cylinder (Italy). Available with a pneumatic or hydraulic braking system. 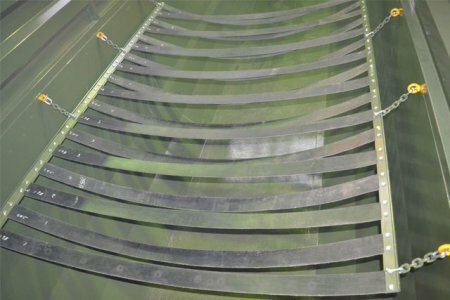 The trailer is made of high-quality steel, it is sandblasted, primed and powder-coated, to ensure longevity and resistance to corrosion. Axles Italy (ADR), tyres Poland (Pronar), braking system – WABCO. 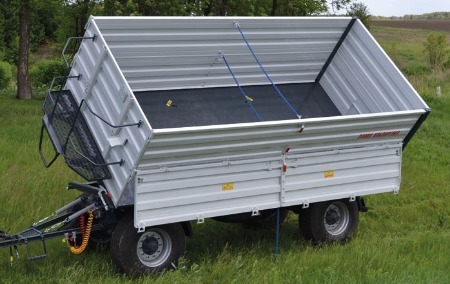 The trailer has a one-side tailgate discharge option, and it meets EU standards. The tailgate has an extra door to facilitate unloading. Tandem axles. 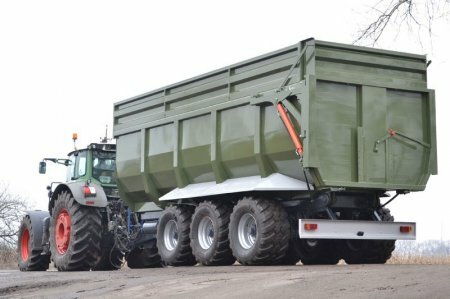 Excellent design and lighter frame provide better traction power at an almost 12-ton payload, making work more effective. Equipped with a 4-stage telescope hydraulic cylinder (Italy). Available with a pneumatic or hydraulic braking system. 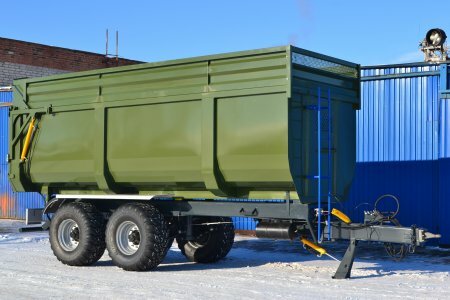 The trailer is made of high-quality steel, it is sandblasted, primed and powder-coated to ensure longevity and resistance to corrosion. Axles Italy (ADR), tyres Poland (Pronar), braking system – WABCO. 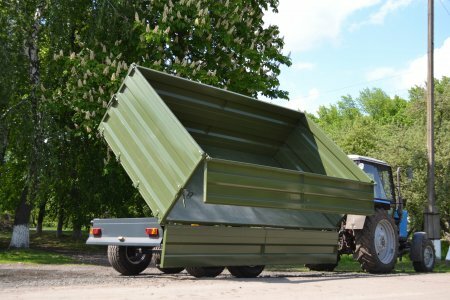 The trailer has a three-side unloading capacity and meets EU standards. Tandem axles. Front axle fixed to a movable frame. Equipped with a 4-stage telescope hydraulic cylinder (Italy). Available with a pneumatic or hydraulic braking system. 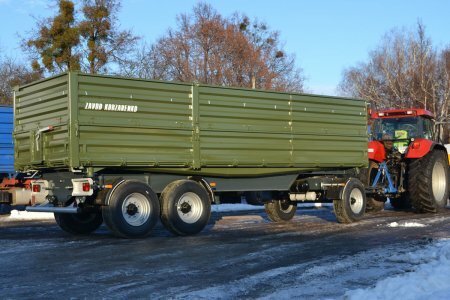 The trailer is made of high-quality steel, it is sandblasted, primed and powder-coated to ensure longevity and resistance to corrosion. Axles Italy (ADR), tyres Poland (Pronar), braking system – WABCO. 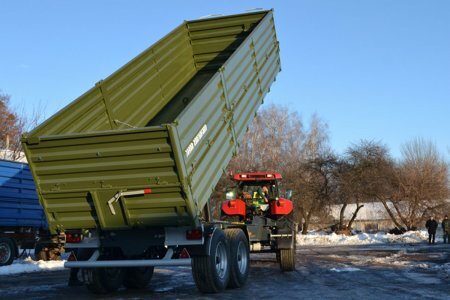 The trailer has a three-side unloading capacity and meets EU standards. Triple axles. Front axle fixed to a movable frame. Equipped with a 4-stage telescope hydraulic cylinder (Italy). Available with a pneumatic or hydraulic braking system. 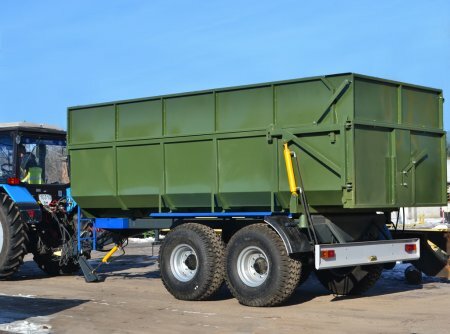 The trailer is made of high-quality steel, it is sandblasted, primed and powder-coated to ensure longevity and resistance to corrosion. Axles Italy (ADR), tyres Poland (Pronar), braking system – WABCO. 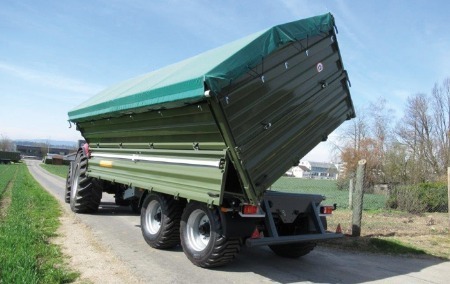 The trailer has a one-side tailgate discharge option, and it meets EU standards. Tandem axles. 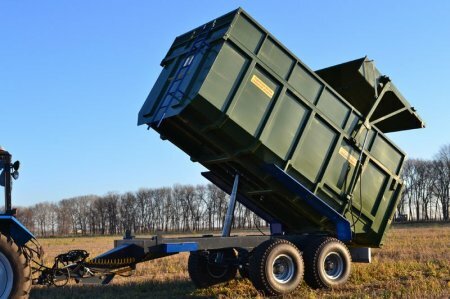 Excellent design and lighter frame provide better traction power at more than a 20-ton payload, making work more effective. Equipped with a 4-stage telescope hydraulic cylinder (Italy). Available with a pneumatic or hydraulic braking system. 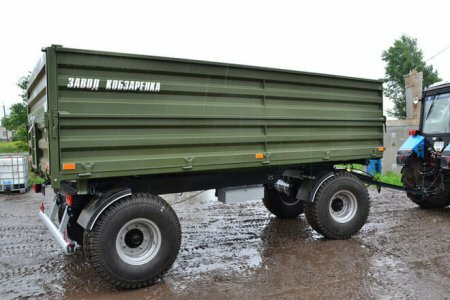 The trailer is made of high-quality steel, it is sandblasted, primed and powder-coated to ensure longevity and resistance to corrosion. Axles Italy (ADR), tyres Poland (Pronar), braking system – WABCO. 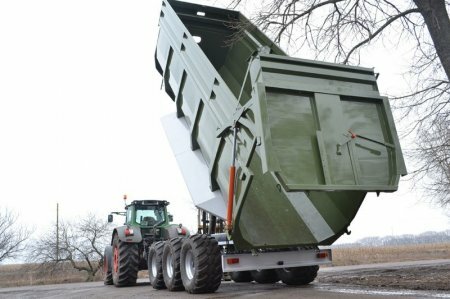 An end-dump trailer. Reinforced triple axles with track bars (ADR Italy). Maximum operating weight 39t. 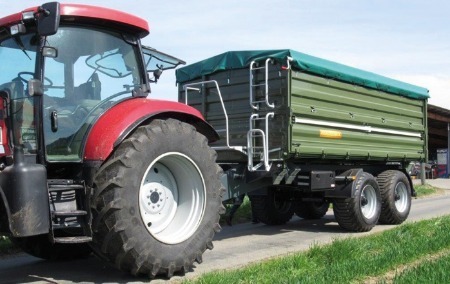 Front and rear axles are movable, which makes the trailer easier to maneuver and extens the life of tires. 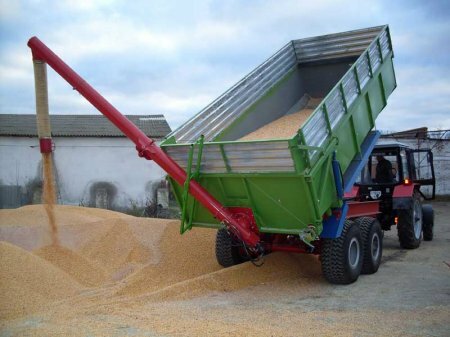 Rear axle has hydraulic support legs for unloading. Tires with more durability 560 / 60хR22,5 (load6,3t 40km / h), (BKT, India). 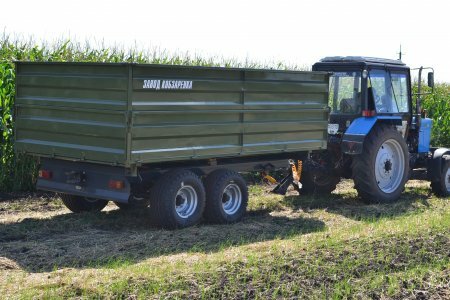 Tires – PRONAR (Poland). Available with a pneumatic or hydraulic braking system. Hydraulics – Manuli (italy), 5-stage, Ø250 lifting cylinder guarantees stability during unloading. The box has a narrower front and wider rear end to guarantee more stability during unlaoding since the material does not get stuck to the sides. 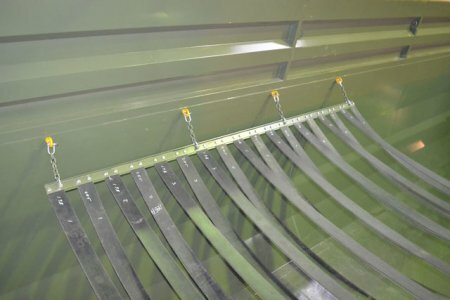 Hydraulic drawbar adjustment. 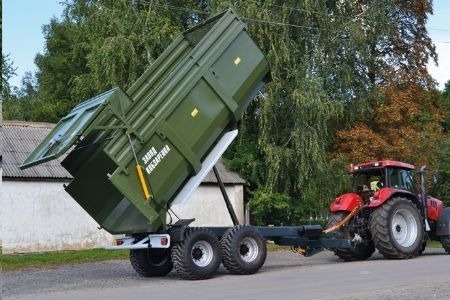 Exchangeable hitching device Ø 40 mm (Scharmuller Austria). Additional gear can be ordered: tires 550 / 60хR22,5. 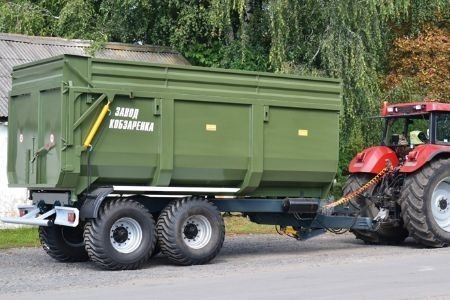 (load 24,0 t) Tires 385 / 65хR22,5 (load20,1 t) Ø 80 mm, tow hitch, trailer cover system.